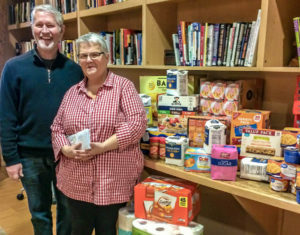 Paula Kauffman, Founder & Director, Out of a Jam, expressed her joy to NIIC clients and staff, as the recipient of The NIIC’s annual Merry-Giving Tree drive. The donated items will help Out of a Jam as it expands programming and moves forward with community outreach. Kauffman started Out of a Jam in February of 2016, after being inspired to serve women at risk and working-aged teens. The organization’s mission is to train students in the basic skills used in a commercial kitchen and assist them in their recovery through life skill workshops. Its most recent business addition is a food truck called Jamm. The organization gives participating students the opportunities to learn more about the culinary industry. For more information about how you, too, can support Out of a Jam, click here. Photo caption: Paula Kauffman, Founder & Director, Out of a Jam, and husband Bernie Kauffman at The NIIC.